There is no rest for the weary. Or is it wicked? Maybe it’s both, and maybe we’re both, and there has definitely been no rest for us lately. The yard is really coming together, and it’s really exciting. We’re actually getting comments from neighbors about how much work we’ve done to the house, and about how pretty soon we might be invited to be included in the neighborhood Garden Walk, and we’re both a little sheepish (but all the more dedicated to improving our plot). Kevin’s vision for the overall design of the garden in back is really coming together, and it’s exciting and exhausting to watch and work on it. 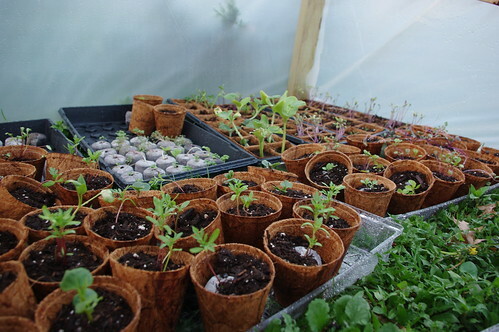 More update pictures of the backyard will be posted later, but for now let’s take a look at the seedlings! 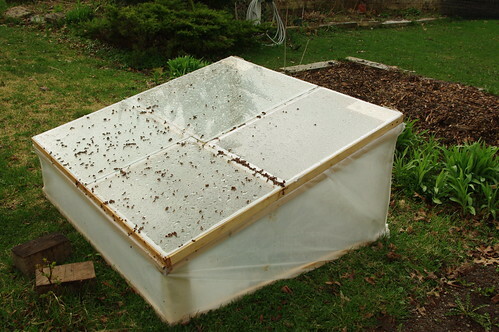 Here’s the coldframe that Kevin built to act as a greenhouse for the seedlings to get them ready to plant. 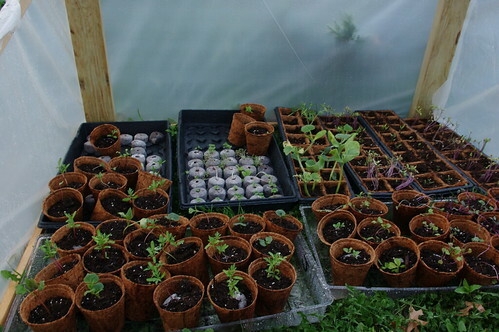 And here are the seedlings themselves! I’m a proud seed mama. They’re getting so big! Almost ready to go in the ground! We’re going to have a pretty giant garden this year, including a very large plot dedicated almost entirely to herbs. My oregano and mint from my little herb plot last year actually (surprisingly) came back this year, which is a little magical to me. Nature amazes me.